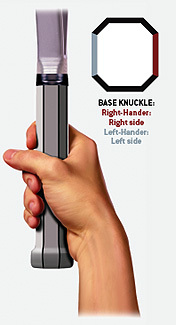 The Continental Grip, also called the Hammer grip, is obtained when placing the hand such that the base knuckle of the index finger is right on the 1st bevel. It is naturally obtained when holding the racket as if it were a hammer. Hence the second name "Hammer Grip". The Continental grip does not allow for much topspin on groundstrokes. Since modern tennis, especially clay court tennis, has shown an evolution towards topspin, the Continental grip has gone out of fashion with professional players for hitting groundstrokes. It is still the preferred grip for serves and volleys. The rest of the grips strike a balance between high spin capacity on one hand, and variety and control on the other hand. 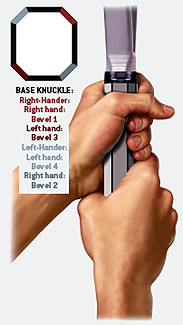 Moving your knuckle one more bevel clockwise (counterclockwise for lefties) from the Eastern forehand grip puts you in a semi-Western grip. 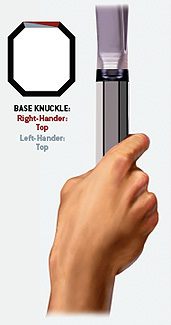 This has become a prevalent grip for power baseliners on the pro tours, and many teaching pros encourage their students to use it.The semi-Western allows a player to apply more topspin to the ball than the Eastern forehand grip, giving the shot greater safety and control, especially on lobs and short angles. Still, you can drive through the ball with this grip to hit a flat drive for a winner or passing shot. It also affords a player the option of taking a bigger swing at the ball since the topspin will help keep it in the court. With a strike zone higher and farther out in front of the body than the Eastern forehand, it’s good for controlling and being aggressive with high shots. The Eastern Forehand Grip is obtained when placing the hand such that the base knuckle of the index finger is right on the 3rd bevel. It is naturally obtained when picking up a racquet lying on the ground, or "shaking hands" with a perpendicularly held racquet. The Eastern Forehand grip allows for more topspin on the forehand while keeping control, because the shift along the handle is only 45 degrees (from the multi-purpose Continental grip). The Eastern Backhand Grip, is obtained when placing the hand such that the base knuckle of the index finger is right on the 1st bevel. This is essentially the same as the Western [forehand] grip and allows for significant spin and control. The basic Two-Handed Backhand Grip, is obtained by holding the racquet in a regular Continental grip with your dominant hand, then placing the opposite hand above holding it in a left-handed Semi-Western Forehand grip. Remember not to 'choke' the neck of the racquet with the non dominant hand and have both hands on the grip. The picture to the right shows an example of a right handed double-handed backhand. Holding the racquet using 2 hands for the backhand is very common, but, there are many variations in the precise positioning of the 2 hands.